Birding Taiwan: Late summer Tainan coast and wetlands. 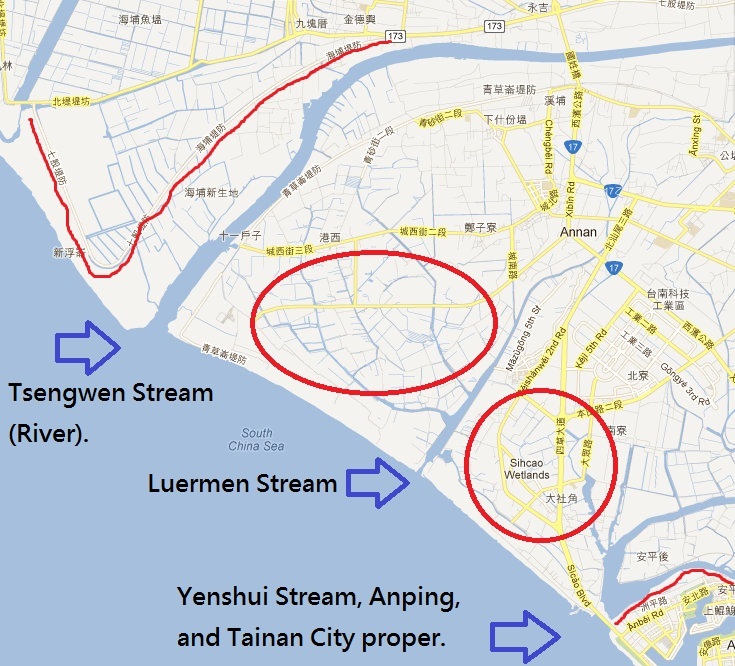 Anping to Qigu (via Sicao) coastal areas. While avoiding typhoon pestilence, I took an hour or two out from the office several times over a span of 12 days mid to late August to explore coastal areas near my home in Tainan (south west Taiwan). Signs of migration starting. Areas visited: Yenshui riverbank cyclepath near Anping; Sihcao various locations west of #17; wet fields near Sangu Village near Qigu (of Black-faced Spoonbill fame); and the most productive - the river side of the north embankment of the Tsengwen river from #17 to the rivermouth. As well as birds, I paid more attention to crabs. My knowledge is ‘very limited but improving’, also a good distraction when tired of nearby waders. Cardisoma carnifex, Mangrove crab Helice formosensis, Scylla serrata, Parasesarma plicatum; and fiddler crabs Uca arcuata, and Uca crassipes. Little Egret - very common. Intermediate Egret - a couple. Malayan Night-heron - 1 in forest along coast just south of Luermen Stream rivermouth. Cinnamon Bittern - 2 or 3 flybys. Yellow Bittern - 1 central Sihcao. Scaly-breasted Rail -1 next to incinerator road. Whimbrel - over 10, mostly near Tsengwen river. Far Eastern Curlew - about 10 total various places. Little Ringed Plover - common. Curlew Sandpiper - about 10 in rice fields and Tsengwen estuary. Red-necked Stint - over 20 several days. Long-toed Stint - around 10 multiple days. Black-tailed Godwit - 1 in fallow fields north side of Tsengwen River. Ruff - 5 in fallow fields north side of Tsengwen River. Wood Sandpiper - over 20 in various locations. Black-winged Stilt - very common. Little Tern - about 5. Whiskered Tern - about 5. Gull-billed Tern - 1 near fish ponds just north of Yenshui River. Red-rumped Swallow - several, usually near active fish ponds. Barn Swallow - common, several very large groups. Black-shouldered Kite - 2 near Luermen Stream. Common Kingfisher - 2 or 3. Brown Shrike - at least 1 near Tsengwen River. Magpie Robin - 1 near city riverside, 1 central Sicao. Common Coot - 1 in pond next to #17, early arrival. White-breasted Waterhen - a couple. Myna - Common, Javan, and Crested. This is what gives birdwatchers a bad name. I had a reliable report of a Lesser Frigatebird in the Tainan area, so of course I dropped everything to spend half the day gazing into hazy, post-typhoon, skies. The closest I came was a maybe/possibly/hmm/probably-not ghostly shape in the scope. What I was very pleased to get out of the way at last was a Chinese (Swinhoe’s) Egret. Tainan has lots of Little Egrets, and I find it a bit tedious scanning them. Anyway - 2 on the sea side of the embankment on the west side of BFS reserve. Birds I am on the lookout for at the moment are Oriental Plover, Nordmann’s Greenshank (possible sighting, unconfirmed), Little Stint, Red Phalarope, Various Snipes, Goldcrest, Various Warblers, and Plain Flowerpecker - the last endemic subspecies missing I think.